Simplicity of installation is just one of several advantages to choosing fiberglass swimming pools. 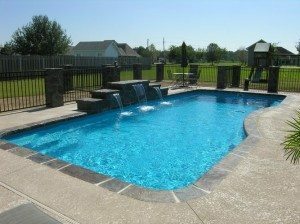 In addition, pool made from fiberglass requires virtually no maintenance. Unlike regular swimming pools, a fiberglass pool never needs to be resurfaced or relined. If the bottom of the pool suffers a hairline fracture, the fracture rarely irrevocably damages the structure. Another advantage of choosing a fiberglass swimming pool is the fact that, unlike plaster pools, the pH level of the water is never affected. For this reason, it isn’t necessary to apply many chemicals to the water in a fiberglass pool. Since an excessive amount of chemicals is not added to the water, it requires less circulating as well. A decrease in water circulating means the pool pump doesn’t have to work as hard. In short, a pool owner’s utility bills aren’t nearly as high as the bills of a person who owns a traditional swimming pool.